In most high-grade contemporary wristwatches, the balance wheel is like that illustrated above: a smooth (without rim screws) Glucydur two or three arm balance. The design is screwless because contemporary balance spring alloys provide temperature correction and make screws on the balance unnecesscary for this purpose. The screwless design also has greater aerodynamic efficiency and is less likely to snag debris that might cause changes in timing. Glucydur is an alloy of (mostly) berrylium and copper and has excellent hardness and high stability over a range of temperatures. 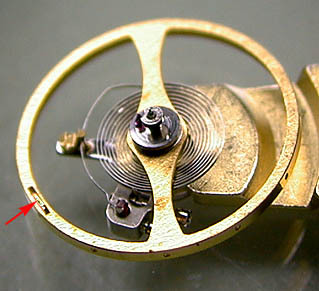 In most watches, the balance wheel is computer poised (and timed to the particular balance spring) and a precise laser cut is made in the underside of the rim (red arrow) to achieve nearly perfect poise. TO SEE A CONTEMPORARY "ADJUSTABLE-MASS"